Abstract: Pharmacological management of uncooperative pediatric dental patients is an acceptable and desirable technique. There are many issues, both pro and con, that influence the direction of development of a philosophy of pharmacological management of children for dental procedures universally accepted in all communities. The pediatric dentist can use various pharmacological methods like nitrous oxide-oxygen, premedication, conscious sedation and general anesthesia. The dentist who uses these methods is not necessarily "taking the easy way out." After the essential get-acquainted appointment, he must attempt accurately to predict a child’s reaction to future definitive dental procedures and if, in his judgement, treatment is in order, he is faced with the responsibility of choosing proper drugs and dosages. The successful use of phamcological method requires consideration and skill and is by no means a facile, automatic method of behavior management. To begin a movement toward such a philosophy, a welldefined approach and initiative need to be mounted. This philosophy will necessitate time, strategic planning,and an embodiment of courage, desire, faith, perseverance,and indefatigable energies for success to occur and for children to be free of the pain, fear, and anxiety associated with proper oral health.. 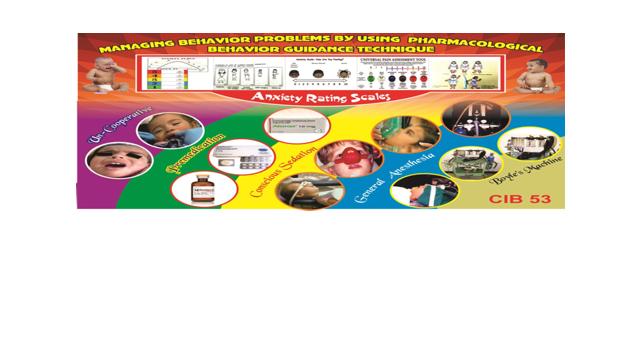 Hence this poster highlights the various pharmacological behavior techniques used for the management of uncooperative pediatric patient. Summary: To begin a movement toward such a philosophy, a welldefined approach and initiative need to be mounted. This philosophy will necessitate time, strategic planning,and an embodiment of courage, desire, faith, perseverance,and indefatigable energies for success to occur and for children to be free of the pain, fear, and anxiety associated with proper oral health..
NELSON TEXTBOOK OF PEDIATRICS; 16th edition; R E Behrman, R M Kliegman, Hal B Jenson.